New Parisian hotels are constantly opening up: whether under the title of ’boutique’, ‘charming’, ‘neighbourhood’ or ‘auteur’ hotel, they revisit the way we all live in the capital, from the ground up. Manually designed by prestigious designers, interior decorators, or simply aesthetes of good taste, these pied-à-terres have been put together with varying degrees of largesse: a princely residence in the Sixteenth arrondissement to a little nest huddled under the zinc roofs of the Ninth, there’s something for all tastes and pleasures. 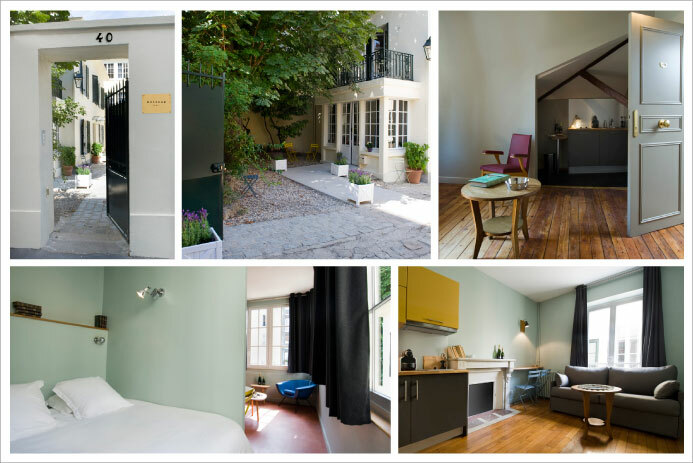 Guillaume Apollinaire, Kiki de Montparnasse, Paul Gauguin and Johan Halvorsen…the fifteen apartments of Helzear Montparnasse inspire one to relive the heyday of the theatre district, just steps away from the Jardin du Luxembourg. Many studios and apartments are available to rent as a private residence, with marble fireplaces, wooden floors, large windows that open onto an indoor courtyard and sleek colours (mustard yellow, teal, plum and mouse grey). Recently inaugurated, this third group address will soon be followed by a fourth, Avenue Marceau, in the summer of 2013. 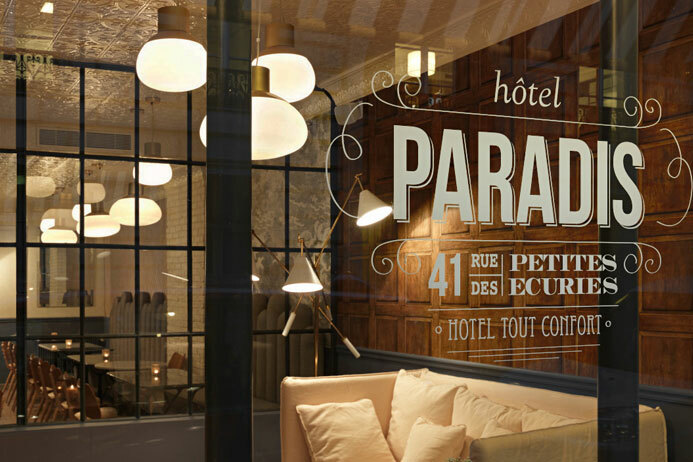 Exclusive haven of peace, Hôtel Paradis plays the contrast between the Parisian gray and a cool and cozy place, nestled in the heart of the tenth district. 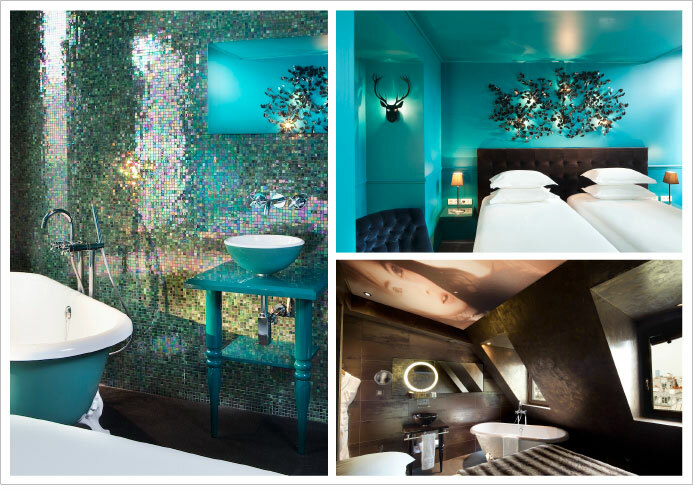 Designed as a decompression chamber, the hotel does not present itself as a place with themes, but with atmosphere. “I thought about the world of sleep, dreaming and I extrapolated on this subject: the clouds, the sky and the birds,” says designer Dorothy Meilichzon. 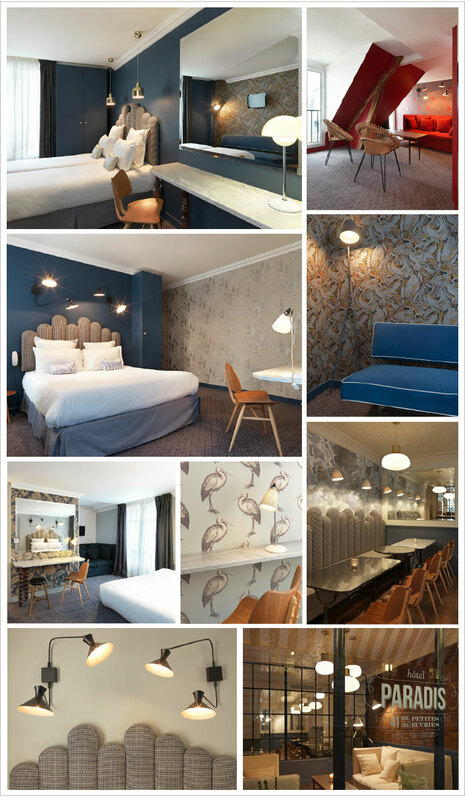 Upon arrival, the Hôtel Paradis is a subtle blend of genres (loft, studio, hotel boutique) and styles (retro, modern, Scandinavian). 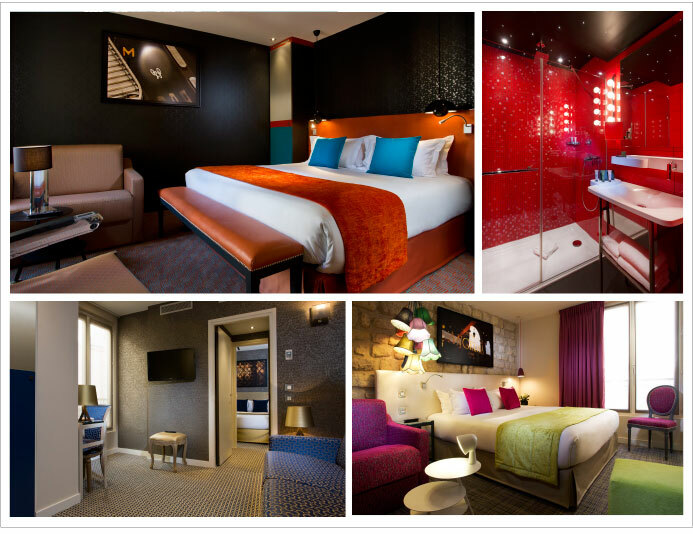 This art of refined and inventive mixity, chic brewing of universes gives the Hôtel Paradis an exclusive charm . And in the kitchen, that’s Pierre Jancou, the chef of the “Vivant”, which offers an original room service: a waiter from the adjoining restaurant directly comes bring the ordered snacks! 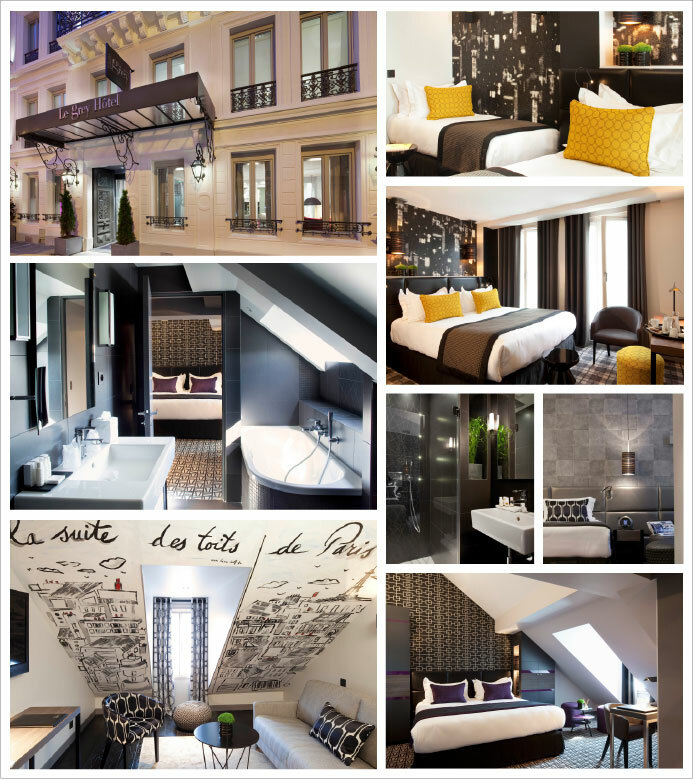 « PRIVÉ » AT THE ROYAL MONCEAU. A secret address in the heart of the Avenue Hoche, the ‘Privé’ apartments at the Royal Monceau look, rent and live like a palace…Past an ultra-private entrance at number 41 on the Avenue, there are three exclusive suites that have each been designed as a private apartment – with the expert service of a major hotel to boot. Residents also have direct access to the My Blend by Clarins spa, a steam room, and even a gym (and to its coach for a personalized program), a home theatre and an in-house florist. Not to mention a private chef…This is the luxury of the capital that lives up to demand. Chantal Thomass is best known for her line of luxury lingerie and playful and refined style, which comes today in the form of the Vice Versa hotel. Located in the heart of the fifteenth arrondissement, this small gem of 37 rooms has been decorated in a very elegant and original style inspired by the theme of the seven deadly sins. Each floor has its sin. Inspired by lust, sloth, envy, pride, anger, greed and gluttony, Thomass has filled this space with extravagant furnishings to create a dreamlike, charming, cheeky and funny atmosphere that is always luxurious and elegant with a touch of topsy-turvy chic. SAINT JAMES PARIS : LES PAVILLONS. 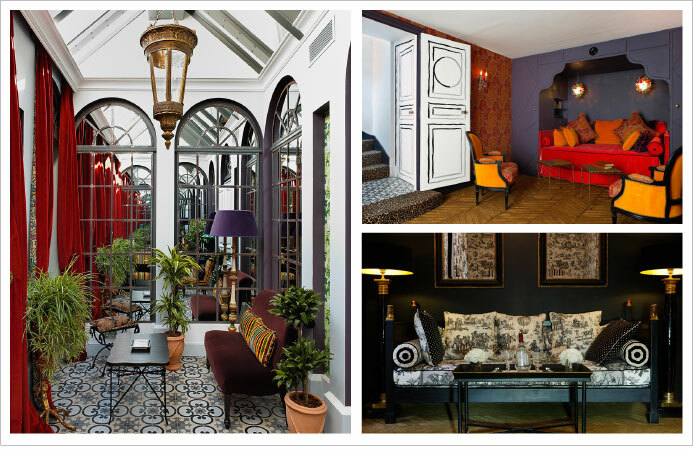 A luxury hotel built in 1892, with a restaurant, bar and private club recently rejuvenated by the designer Bambi Sloan, the new and improved Saint James Paris is like a small castle with its residential flats. Two in number, these small 80m2 households are spread over three floors and lie hidden at the end of the garden. And whilst the Pavillon d’Amour has a private wellness area, the Pavilion Belles Feuilles houses its own home theatre room. Two contemporary worlds enhanced by many artistic references for a contemporary stay, in the heart of the sixteenth. 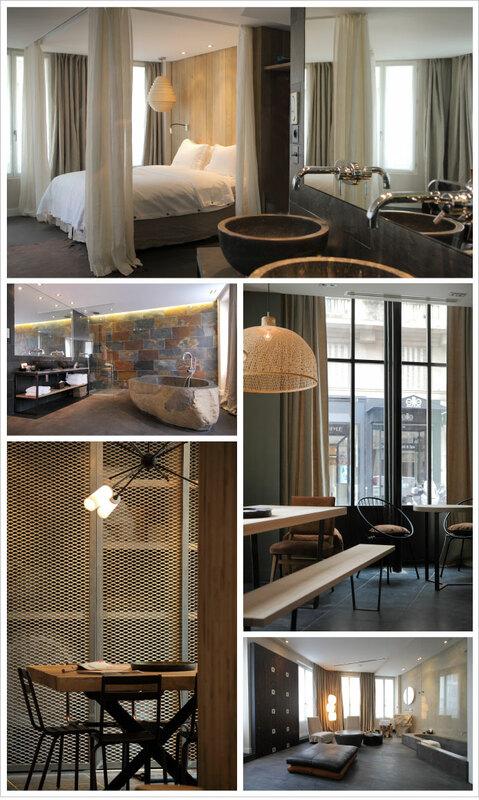 A subtle blend of craftsmanship and contemporary design, the Hidden Hotel reveals a world of serenity and simple purity. A perfect allegory, it is an invitation to identify what is hidden, discover sensory treasures and seek out confidential spaces. The raw materials mix with a world of luxury to create a natural paradox away from the urban bustle. Christophe Sauvage and Philippe Vaurs paid special attention to the choice of materials, treating them as though they were emotions to rediscover. Intuition, Inspiration, Emotion, Sensation, Exception: the names of the 18 rooms and 5 suites are evocative with a refined and intimate decor. With an unbeatable view of the Eiffel Tower, a sleek interior dotted with sculptures and works of art, La Réserve Paris continues the myth of the brand which, from the shores of Lake Geneva to those of the Mediterranean, has always offered as ‘green living’. 10 apartments from 150 to 300 m2, home to many stars visiting the capital, La Réserve Paris contains a host of exceptional hotel services – Valet, concierge and exclusive housekeeper, personal chef on request…nothing is impossible. As for the decor, the talented interior decorator, designer, and gallerist, Rémi Tessier married wood, concrete, stucco, metal and glass here with a gift for the pure. Halfway between a boutique hotel and a gallery of contemporary photography, the Hôtel Atmosphères offers the opportunity to holiday amongst a hundred original prints by Thierry Ouches. The photographer’s eye opens up the doors of an elusive Paris, immortalized with great subtlety. With the complicity of Vincent Bastie, the 56 rooms and suites and two apartments at Hôtel Atmosphères weave a story in which Paris is the setting and each traveller can create their own tale. All the colours, materials, furniture have been chosen with subtlety and elegance to compliment the images of the photographer. The ubiquity of art comes together nicely with the original architecture, as demonstrated by the majestic entrance with the suspended staircase. 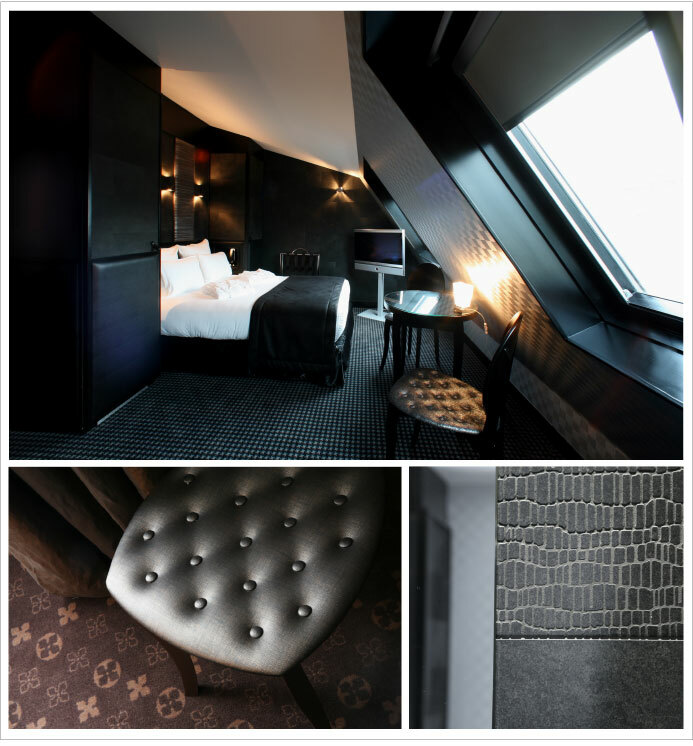 A sophisticated parenthesis in the heart of the ninth district, the Grey Hôtel has adopted an audacious look: a chromatic variation based around grey, the soul of the place. Sophie Gazil, the owner of the site wanted to imagine a place where colour is present, but not ubiquitous, an invitation to travel in the world of gray, punctuated with bursts of colour and complemented by a selection of iconic contemporary lighting. A palette of twelve “grey colours” has been specially created by the Cabinet Bastie to give the place a refined and welcoming “grey spirit”. The 33 rooms and suites are illuminated by touches of silver, purple, saffron and charron blue. The colours create a softness reinforced by sculptures by Julie Gauthron, fixed at random against the walls, and stripped linear furniture designed by Elsa Joseph, with printed and colourful fabrics that melt together to create a unique atmosphere. 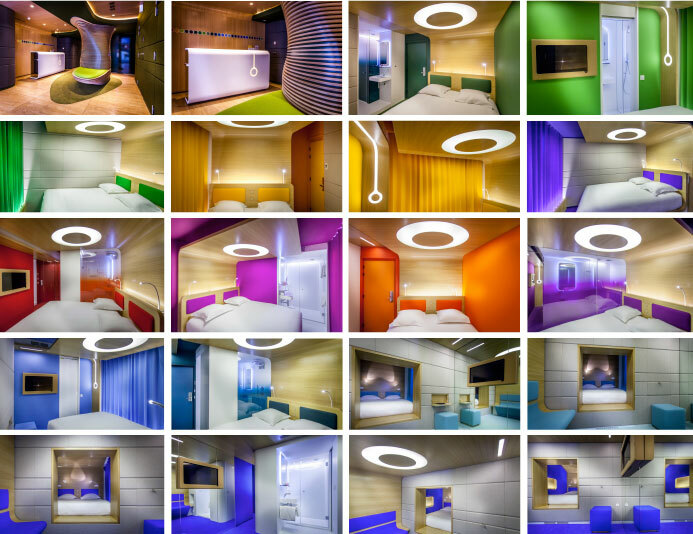 With a single letter as its name, the first Ora-ïto hotel, built in the 1st arrondissement, revolves around 29 functional rooms called “capsules” due to their intimate size. The latest technology, sleek designs, flashy colours and the whole universe of the designer can be found here in an ambience of total comfort, away from the stresses of life in a concept unique to the artist: “simplexity” (simple and complex). The strong point of O: the bar, with its strong look and calm feel, is a must-see venue. Stingray leather, elephant, crocodile and cobra skins…The luxury materials that cover the walls of L’Addresse pose an original contrast to the typical sophisticated fabrics. Designed in an “haute couture style “, the hotel is adorned with the finest materials that can be caressed with the eye or felt with the hand. Each space is coloured in the tones of the universe with a timeless allure: grey, golden brown, glistening white, black embellished with gold and silver. Tucked away close to the Porte Maillot, L’Addresse is a place for connoisseurs of the rare and extraordinary: the hotel only has 23 rooms. A confidential address. Whether through fashion, the world of perfumes or decorative arts, Stella Cadente expresses her creativity with great freedom and enthusiasm. 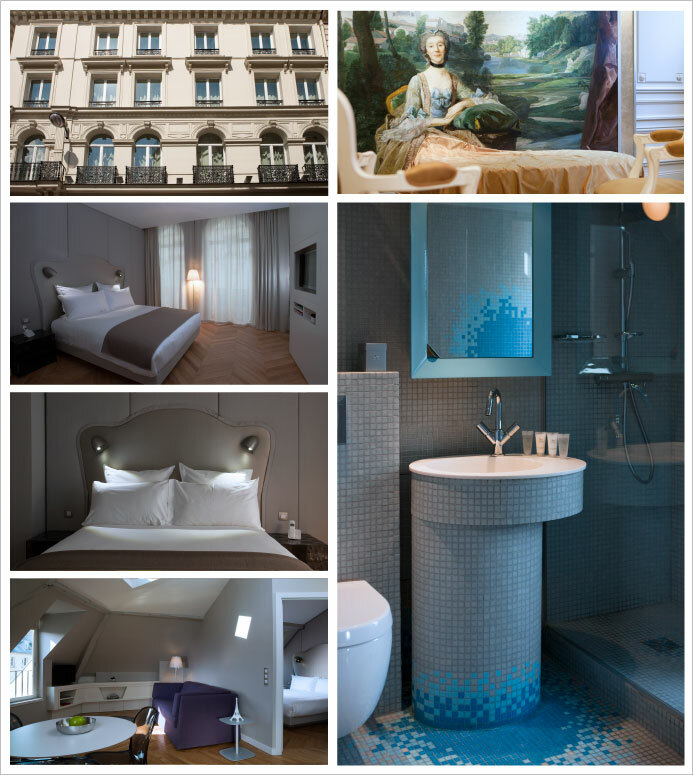 A creativity that she has fully expressed through the hotel L’Original in the heart of the Marais. The furniture and objects adorning the hotel were specially designated and designed by Stella Cadente and consist of dream worlds inspired by fairy tales and classic novels (Peau d’Ane, Alice in Wonderland, the Queen of Crystal…), but also the seven deadly sins. The choice of materials and the harmony that emanates from the decorations designed by the stylist create a highly original atmosphere. To be expected, right? Typically courted for their slightly futuristic design projects, Patrick Jouin and Sanjit Manku have entertained a new genre here. They designed the 17 apartments and studios of Résidence Nell, anchored in the heart of the ninth district, to be very cosy in deed. Inspired by the practicality of New York apartments, these homes have been dressed up in shades of gray, are comfortable and practical, and accented with some colourful pieces of design. An original way to stay in Paris.